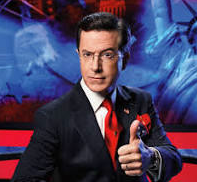 Whether you know who Stephen Colbert is or not – by the way he’s the comedian who hosts his own late night TV show, “The Colbert Report,” I recently read an article in the New York Sunday Times magazine about him where one line made my skin tingle. The author says, “The role he (Colbert) was born for…hadn’t yet come his way.” It references the fact that Colbert wasn’t very successful when he began his comedic career because he looked too bland, too sane and too conventionally good-looking. That the role he was born to play, the character he currently plays on his nightime parody show, is the one he unknowingly was waiting for. And by virtue of not giving up, for years, but persisting, he eventually got to play his role. The take-away for me is if we haven’t known great success in the past, and/or are trying to find our way now, perhaps the role we were born to play – whether that’s in our work, love life, family etc, just hasn’t yet come our way. It may still be waiting for us if we just persist. It inspires me to think that one day all of what I’m doing now may come together to fruition in a new way and be my penultimate role. Well, it’s a nice thought isn’t it?